Not many businesses have been around since 1923 much less still run by the same family. Each day when Bob Zakian arrives at his rug cleaning plant and showroom on Parkside Avenue, across from the Mann Music Center, he is reminded how his grandfather and then his father took extreme care in cleaning their customers' valuable Oriental rugs. Soon after immigrating to this country around 1920 Hagop Zakian and his wife, Aghavni, started going door to door in West Philadelphia offering their services as rug cleaners. They got a truck and carted rugs to their home where they scrubbed them with soap, squeezed them with rollers and then hung them to dry. It was a very basic business back then but it grew nicely. Their three sons and two daughters all entered the family enterprise. Aghavni and Hagop Zakian founded the Zakian rug cleaning business in 1923. An early Zakian Brothers delivery truck when the business was located on Walnut Street in Philadelphia. The Company survived the great depression, World War II and numerous economic downturns. In 1956 the business moved to its current location and the family installed modern equipment to clean carpets of all sizes. The rugs move on conveyors through various dusting, soaping, and rinsing cycles before being hung in a controlled drying room with a 24-foot ceiling. After drying for several days, the rugs are groomed, inspected, rolled up and delivered back to their owners all in about a week's time. From 1960 to 1980 the business was in the capable hands of Bob's father, Haig, and his father's brother Aram and nephew Jack. Bob Zakian joined the business in 1972. With his able leadership the Company has grown to become the largest and most-trusted rug cleaner in the tri-state area. The Company now services customers throughout southeastern Pennsylvania, southern New Jersey and Delaware with the same care and commitment. Thousands of area homeowners come back year after year for the expert cleaning and repair work that Zakian provides. Robert (Bob) Zakian, third generation, continues the family tradition of quality workmanship and affordable pricing. An early Zakian company logo. In addition to rug cleaning, Zakian has a long-standing reputation for restoring damaged rugs. The expert craftsmen repair holes and worn areas in rugs by reweaving small sections of a rug with wool yarn of a matching color. They also replace worn or damaged fringe and edging. Today, Zakian also sells fine Orientals from around the world as well as area rugs and premium wall-to-wall carpeting. Now, after nearly 90 years, Zakian is more than a family affair. It's is a Philadelphia institution. 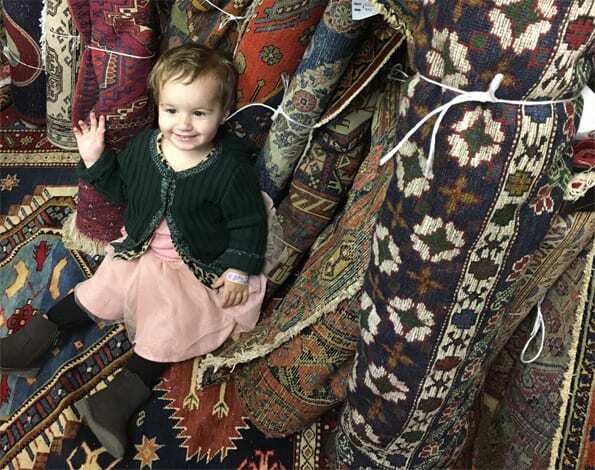 Adorable three-year-old Eojeni recently visited with her great uncle Bob Zakian, owner of Zakian Rug Cleaning. This fifth-generation youngster appears to be right at home among the oriental rugs in his office.